This article is adapted from a paper I wrote for my employer shortly after the Macworld Expo. We have been using Macs since 1988 and remain almost 100% Macintosh to this day. The most immediate impact of Macworld New York on our business is the new mouse and keyboard that ship with all desktop Macs. Gone are the round mouse and the small keyboard missing some crucial keys. This will save us roughly $100 on every new iMac and Power Mac purchase, since we'll no longer need to buy third-party mice and keyboards. Apple has extended the iMac line from three models to four while reducing the number of colors from six to five. The biggest difference is that the new colors are less garish and more professional. New colors are indigo (dusky blue), ruby (deep red), sage (dusty green), and snow (translucent white). The base 350 MHz iMac, which had been a $999 blueberry computer, is off the market. It will return in September in indigo at $799. Since this model already provides all the power many employees need, between the $200 price reduction and the inclusion of the Pro Mouse and Pro Keyboard, we'll save about $300 per system when the new iMac becomes available. Apple has moved the 400 MHz iMac DV to a $999 price point (from $1,299). The three differences from the previous iMac DV are colors (the new DV comes in either indigo or ruby), substitution of a CD-ROM drive for the more expensive DVD drive, and the new mouse and keyboard. Until the new $799 iMac ships, this will be our best choice for employees who don't require a 17" or larger screen. Next is an improved version of the original iMac DV called the iMac DV+. The $1,299 DV+ comes in indigo, ruby, and sage. Like the just-discontinued DV, the DV+ has a DVD drive, which really isn't necessary in the workplace. It runs at 450 MHz, 12% faster than the old DV. Finally, the new iMac DV Special Edition runs at 500 MHz and comes in graphite or snow. The $1,499 model is a lot more than we need in the workplace. The entry-level Power Mac G4 still runs at 400 MHz, still sells for $1,599, and now includes the improved mouse and keyboard. For anyone who doesn't need a high-end Photoshop machine (anyone outside of design) but needs a larger screen than the iMac's 15" monitor, it's an excellent buy. On top of that, the Pro Mouse and Pro Keyboard eliminate the need to spend $100 for third-party mice and keyboards. 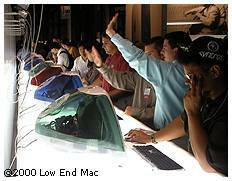 The next steps up in the Power Mac G4 are dual-processor models running at 450 and 500 MHz. Very little software currently supports multiple processors, although Photoshop does. Outside of the design department, there is no reason to consider the dual-processor Power Macs. Apple's newest model is the tiny Cube, which measures 7.7" x 7.7" x 9.8" and contains a 450 MHz G4 processor, making it perhaps the most powerful desktop computer ever in terms of processing power per cubic inch. Best of all for the workplace, it's not brightly colored or even graphite gray. Instead, the cube is a silvery color in a crystal-clear enclosure. Not only will it look right at home on a desktop, but it won't dominate workspace like the Power Macs do. Unfortunately, because of the faster processor and the coolness factor, the Cube sells for $200 more than the Power Mac G4/400. Nice as it is, for most users who need a larger screen than the iMac but don't need huge amounts of computing power, the Cube is overpriced. The larger, more expandable Power Mac G4/400 sells for $200 less, making it the best value for users who require a 17" or larger monitor. My guess is that Apple will discontinue the Power Mac G4/400 when it exhausts its supply of 400 MHz processors, possibly dropping the price of the Cube at that time. Should that happen, the Cube would be our top choice for non-designers who need something bigger than the iMac's 15" display. Apple announced no changes in the iBook and PowerBook lines. Our current hardware proposal included over three dozen iMacs and Power Mac G4s. Thanks to the new mouse and keyboard, we can save approximately $100 on each future purchase. Further, once the new Indigo iMac ships in September, we will be able to trim an additional $200 from each iMac purchase. With 15 iMacs remaining in the proposal, should we purchase all proposed hardware, we will save between $3,500 and $6,500 depending on how many iMacs are purchased after the new $799 model is available.